Former Real Madrid Star, Cristiano Ronaldo has been jailed. He accepted a £17m fine after pleading guilty to tax fraud in Madrid on Tuesday morning. 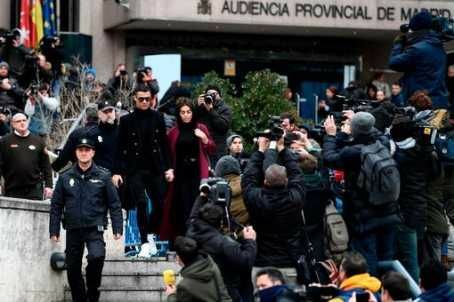 The judge denied Ronaldo's request to appear by video or enter the building by car and arrived at the courthouse with his girlfriend Georgina Rodriguez. His lawyers had argued that given his fame, avoiding the main entrance was needed for the player's security. The deal, agreed in advance, includes a 23-month jail sentence. But in Spain, convicts do not usually do time for sentences under two years. The charges are from his nine years at Real, whom he left for Italian club Juventus last summer. Spain to hide income made from image rights.